Rocker Ozzy Osbourne will part company with his record label Sony, his wife has told a US magazine. He will leave the Sony record label after 23 years because he is bored with the partnership, Sharon Osbourne told People magazine. The former Black Sabbath frontman decided to quit after the departure of the company's controversial boss, Tommy Mottola, in January. "It's an opportunity to start fresh," Osbourne, who also manages her husband's career, told the magazine. "We want that excitement back," she said. Mrs Osbourne is also negotiating for the couple's 18-year-old daughter, Kelly, to leave Sony Music. 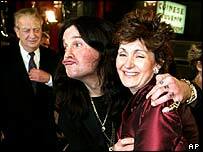 The Osbourne family became the focus of media attention following the global success of their fly-on-the-wall TV show about their everyday life. But the show has had its pressures: Osbourne's teenage son Jack recently checked himself into a rehabilitation clinic after admitting alcohol and drug problems.